As in previous years selected comics, as well as being presented and exhibited during the Festival, will be reviewed by Andrea Plazzi , editor of Rat-Man . A unique opportunity to have both an authoritative professional opinion and a prestigious review on your work! We are looking for comics who know how to fully exploit the freedom given by not being included in a commercial circuit, and therefore possess at least one of these characteristics: originality in writing and / or in the drawings; weird or irreverent themes; humor and ability to surprise. The technical quality will be appreciated but not essential: we are not interested to set up a parade of talented painters, but a genius of self-produced shows that will make the audience of BMB laugh uproariously. The selecting jury, with unquestionable opinion , will choose the products which it believes best represent this idea. As usual, registration is FREE. It is possible to enroll more than one work per author. There is no limit to the number of comic pages for each work, but during the Festival a maximum of 8 boards by author will be exhibited. The works are full property of the author, which will allow the organizers of BMB to publish them on the website forever, and expose them in the local festival for the whole duration of the event. CREATE YOUR ACCOUNT, carefully filling in each field the registration form. This data will be kept by Bravo Ma Basta and will not be made public. It will be used only to make contact with the authors and for internal administrative activities. If the data is not filled in completely you will not be able to enroll your works in the contest. After logging in this website, the Comics Entry Form will be available. The bmb6 is international, and we chose to use English as the official language for a practical question. 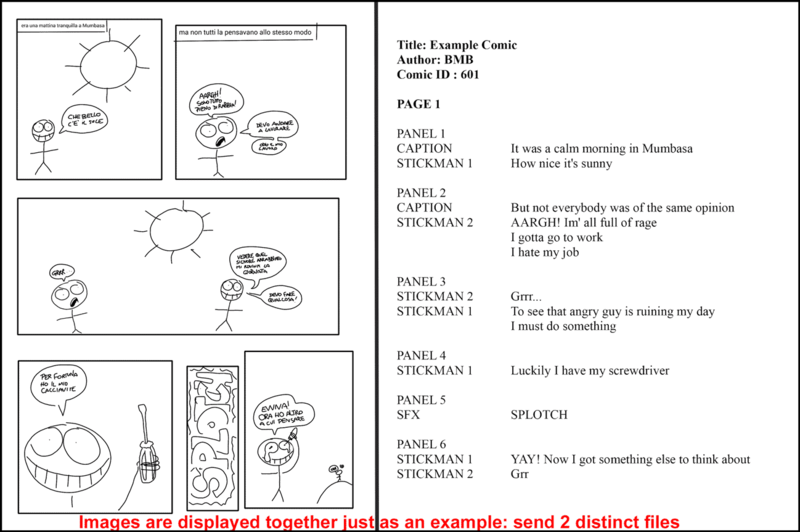 We suggest to directly submit a version of the work in English, but if this is not possible (for example if the lettering was an integral part of the design, or if the tables were not changed for some reason) it will be sufficient to send, together with the comic, a synoptic translation in PDF. With synoptic translation we mean a translation in which each page corresponds to a drawing sheet. For the exhibition taking place during the festival the comic sheets will be printed in A3 format, so a resolution of around 3500 x 4900 pixels (the measures of an A3_300 dpi) will be more than enough. There are no limits to that effect, but a lower resolution will result in a lower quality print and a higher one the risk of unnecessarily burdening the file. The form must be completed in its whole with the requested informations. After the form submission an email will be sent to the user with all the necessary information for the electronic submission of works.